Lots of people need something like this rugged folding bench, which had a 600 lb rating. Sadly, this bench was discontinued by the manufacturer. Despite its weight of 17 lbs, the bench was still portable, could be carried short distances by most people, was comfortably wide (made in 22 inch and 26 inch widths) and had no armrests to get in the way. This means that if you needed seating wider than 22 inches, you could have used this bench. 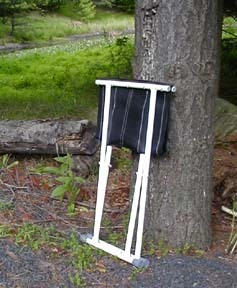 It was good for visiting medical offices, homes, and outdoor settings that have no seating you can use. This bench could also be used as a shower/bath bench, and was especially helpful when the bench couldn't be kept in the bathtub or shower, but had to be stored when not in use. The fact that it folded up meant that it took much less space to store than most shower benches. The bench was made of stainless steel with white enamel finish, was impervious to water and bad weather, and had an extra-heavy-duty nylon seat. The height was 19 inches. The price was over $300. We were sad to ship the last one in February, 2009. We hope to convince the manufacturer to re-start their production line some day, so people can get them again. 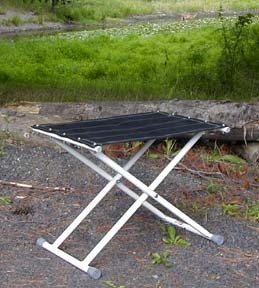 Portable bench shown folded, for carrying or storage. Portable bench ready for use.